Got a scanner at home? 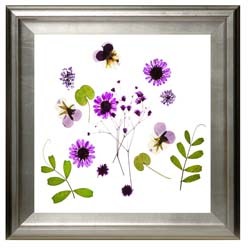 Make a pressed flower picture with a modern twist. Press a few fresh flowers in a book, then place them in an arty position under your scanner. Scan, then print onto photo paper. Glossy paper will give your prints a professional looking photographic finish. Paper stained with tea (and dried) will give an vintage botanical effect. If you want to print large-scale artwork, take your digital file to a local printer and have them print your artwork onto a large sheet of glossy paper. Choose a fancy frame to match your print. So simple, but such beautiful homemade artwork.